This article was originally published by Political Violence @ a Glance on 20 October 2016. After six years of negotiations, the Colombian government and the leadership of the Revolutionary Armed Forces of Colombia (FARC) signed a peace agreement to end one of the oldest and bloodiest wars in the country’s history. Although not required to do so by law, President Santos sought to legitimize the agreement by asking Colombians to either ratify or reject the agreement in a referendum. On October 2nd, the “NO” vote (rejecting the peace agreement with the FARC) won with 50.22% of the vote, taking the world—and most Colombians—by surprise. 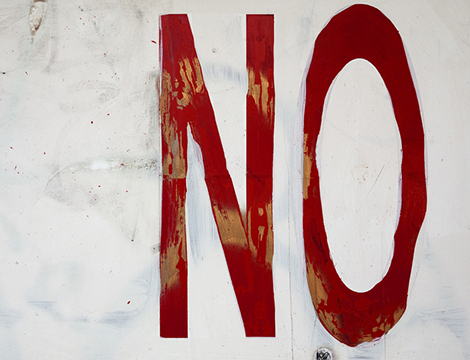 The leaders of the NO campaign, the international media (see here and here), and a few scholars, have privileged an interpretation of the NO vote as a cry for justice. In recent days, representatives of the NO vote made harsher penalties to the FARC one of their central demands to support a modified agreement. As several sources have noted, this was an election where voters were not properly informed. The NO campaign avoided talking about the content of the agreement, as one of its main managers admitted in a recorded interview. Instead, the campaign focused on making statements that would cause fear and indignation, some of which were entirely false, like the supposed imposition of a new definition of family and gender against Christian values. At the same time, as analysts have pointed out, the government was too complacent and failed to explain to voters what the deal would entail. It is therefore unclear whether those who voted NO were demanding more punishment for the FARC. What the evidence does suggest, however, is that those who have been most affected by the FARC were not the ones rejecting the peace agreement. How did conflict zones vote in the referendum? Two opposing views have emerged. Some have argued that conflict zones voted against the deal. Several scholars and experts in Colombia, on the other hand, have noted that support for the agreement was higher in the periphery of the country—the most rural and poor places—as well as where violence has been most intense (here and here). Some have also pointed out that although many of the places that have suffered the war voted YES, others voted NO, and that voting patterns vary depending on the type of victimization (here and here). This is further complicated by the fact that a turnout of 37% is extremely low, even for Colombian standards—it was 49% in the last presidential election. Finding out how areas that have been affected by the war voted is difficult for several reasons. 1. Although it may seem surprising, it is difficult to know which are the “conflict zones” or areas affected by the war. Colombia has rich data on violence, but violence is not necessarily a good proxy of armed group presence, as I have argued elsewhere. 2. We lack data on the non-violent behaviors of armed actors—like their creation of institutions to rule civilians—and these behaviors also affect the population, as I have explained elsewhere. If we only rely on data on violence, we may be missing some of the populations that have lived under the strong rule of an armed group for years. 3. Armed groups may use different forms of violence under different circumstances. Hence, measures of different forms of violence may be capturing specific dynamics of the conflict rather than serving as a proxy of victimization in general. 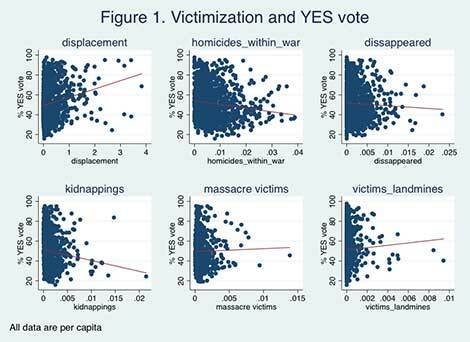 This may explain why the YES vote is positively associated with some forms of victimization (like displacement and massacres) but negatively associated with others (like kidnappings and disappearances), as Figure 1 shows. 4. Data on violence and voting behavior are aggregated at the level of the municipality. However, sometimes people experienced the war in drastically different ways in the rural areas and urban centers of the same municipality. Local communities that experienced the war directly may have voted differently, but the correlation between war experiences and voting can get lost when data are aggregated at the level of the municipality. 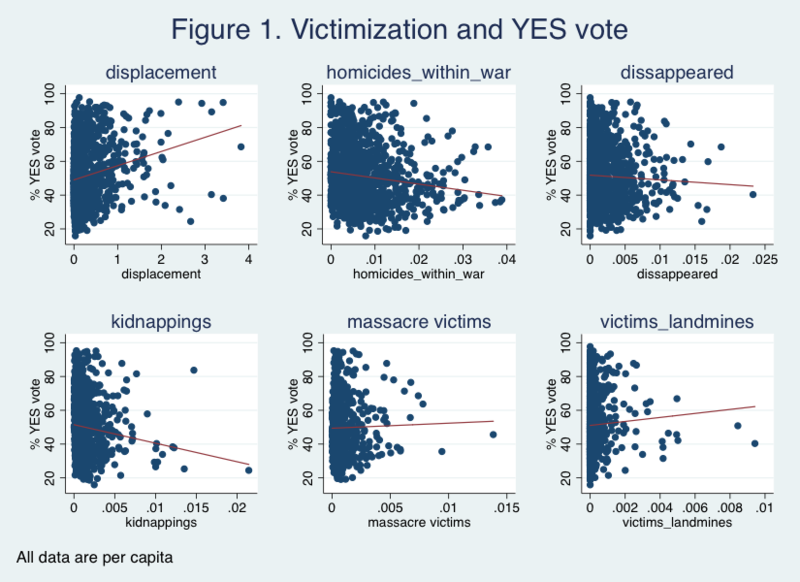 Despite these limitations, I estimated regressions controlling for a rich set of economic, political, and geographic factors as well as past voting patterns, and found that the YES vote is indeed associated with a higher rate of victimization events. This finding is consistent with the results obtained by other scholars (here and here). Over the last few years, I have studied the dynamics of interaction between civilians and combatants in conflict zones throughout Colombia. Here I rely on data that I gathered on a random sample of about 80 communities where armed groups have been present – this included 29 municipalities located in 19 of the 33 departments of the country. 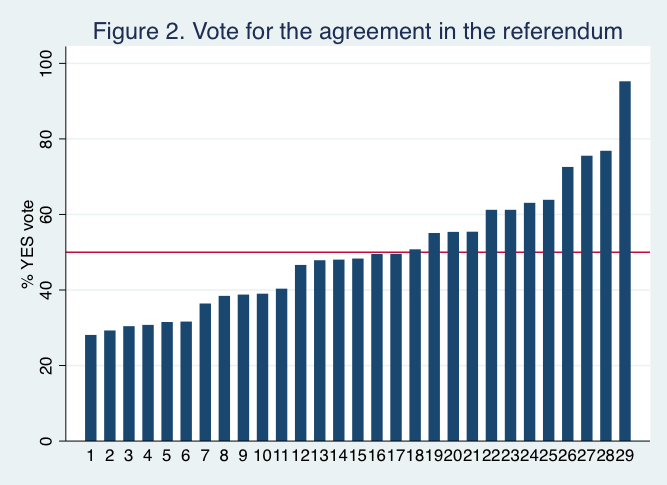 As Figure 2 shows, support for the agreement in the referendum varied across the sampled municipalities, with the YES vote getting as much as 95% in some places and as low as 28% in others. However, these data mask the variation that exists within these municipalities. 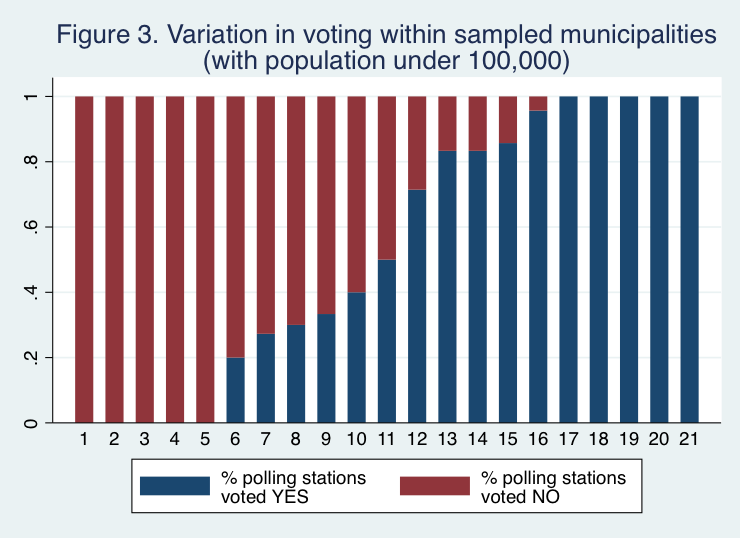 As Figure 3 shows, the percentage of polling stations within each sampled municipality that achieved the same result—rejecting or supporting the agreement—varied greatly (I exclude large municipalities, where such variation is expected). 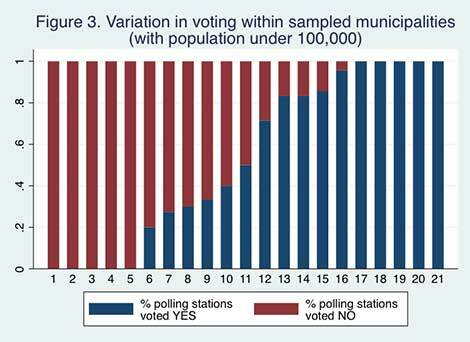 How do war dynamics at the community (sub-municipal) level relate to these voting patterns? In May, 2016, together with Laura García, I conducted a survey with almost 2,000 residents of 53 communities in these municipalities and asked them, among other things, about their views on the referendum. Although their stated vote intention may differ from their actual vote, their responses offer a window into the preferences of those living in conflict zones. 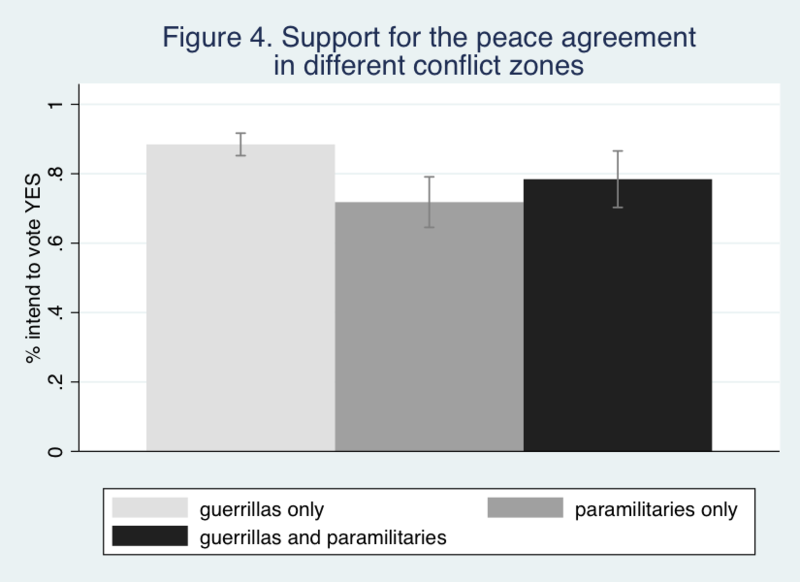 Figure 4 shows the percentage of people who intended to vote YES in the referendum, in communities where different armed groups have been present: (i) only guerrillas, (ii) only paramilitaries, and (iii) both. As the data show, support for the agreement was quite high. In fact, in 90% of the communities at least 60% of respondents intended to vote YES. Support for the agreement was 14% higher in communities where the guerrillas have been present than in communities that only had paramilitary presence. This difference is statistically significant at 0.1%. This result suggests that those living in areas affected by the presence of guerrilla groups were more likely to support the referendum. How about those directly affected by violence? As Figure 5 shows, respondents who have been victimized by the FARC or by any other armed group are neither more nor less likely to support the agreement than other residents of conflict zones (victims are slightly more likely to support the agreement but the difference is not statistically significant). 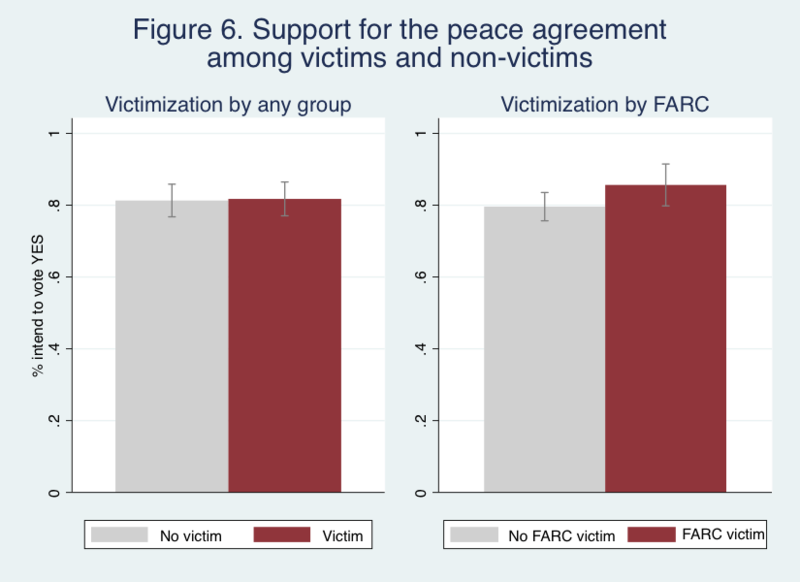 Together, these results suggest that living in a community affected by the war, especially by the FARC, increased the likelihood of supporting the agreement among all residents, both victims and non-victims. In conclusion, if the NO vote was indeed a cry for justice, it does not seem to be the cry of those who have been most affected by the war. Ana Arjona is Assistant Professor of Political Science at Northwestern University. She obtained her PhD from Yale University. She is the author of Rebelocracy: Social Order in the Colombian Civil War (in press, Cambridge University Press) and co-editor of Rebel Governance in Civil War (Cambridge University Press, 2015).